The 2014 Indianapolis GP will be the last American race for Colin Edwards, as The Texan Tornado will be hanging up his spurs at the end of the MotoGP season. The help commemorate his departure from Grand Prix racing, Edwards has picked a special helmet and leather design for the Indy GP, and unsurprisingly, it has a military theme. Edwards has always used the Indianapolis GP to debut his helmets that honor the branches and people of military service, and the American rider told us that this weekend’s camouflage livery is an homage to that tradition. Saying goodbye to his home crowd on Sunday, the Texan will for sure also race at Silverstone and Valencia, though the rumor is that Alex de Angelis will rider the NGM Forward Yamaha at the rest of the year’s races. What’s Bigger: Indy Motor Speedway or The Vatican? Yesterday we wondered how many college football stadiums we could fit inside the Indianapolis Motor Speedway oval, and today we tackle a different kind of religion (tackle, get it!) in our quest to fathom how big the facilities are here at IMS. So with that in mind, what could be more appropriate than a small city…Vatican City. The Vatican is is the smallest internationally recognized independent state, by both area (110 acres) and population (842). Can this small country fit inside The Racing Capital of the World? Continue forth to find out. For the past four years, my coverage of the Indianapolis Motor Speedway has followed something of a ritual. The riders would ride the track. The riders would talk to the media about how awful the track was, the bumps, the different types of asphalt, the drainage covers, the joints between the tarmac, the corners which were too tight. I would write about what the riders had said in my nightly round-ups. And I would receive an email complaining about what I’d written from IMS’ otherwise excellent media office. It’s hard to blame Indy’s media office for such a reaction. They are the best media office of all the circuits on the calendar, by a country mile, better organized and providing useful and timely information on everything happening on the track. It is part of their duty to handle criticism of the circuit, especially that coming from a bunch of Europeans only using half the real Speedway track, and requiring corners. They were only doing their job. They will have a much easier job this weekend. Rider reaction to the changes made at Indy has been overwhelmingly positive, with barely a whisper of criticism of the track. The single surface on the infield is a vast improvement, the changes to the track layout make it much more suitable for motorcycle racing, and most of the bumps have been removed. The circuit is “more like a normal track,” as Marc Marquez put it. Pol Espargaro concurred. Indy is “more of a motorbike track” the Tech 3 man said. Colin Edwards Only Racing at Indy, Silverstone, & Valencia? Colin Edwards will contest only three more MotoGP rounds in the 2014 season. The Texan is to race at Indianapolis, Silverstone and Valencia, before hanging up his helmet. From Brno, Alex De Angelis will take Edwards’ place, and Edwards will race as a third rider for the NGM Mobile Forward Racing team in the UK and at the last race of the year. Edwards’ final year in MotoGP has not gone according to plan. The Texas Tornado had hoped that the arrival of the Yamaha Open class bike at Forward, to replace the Kawasaki-powered CRT machine would spark a revival in his fortunes. 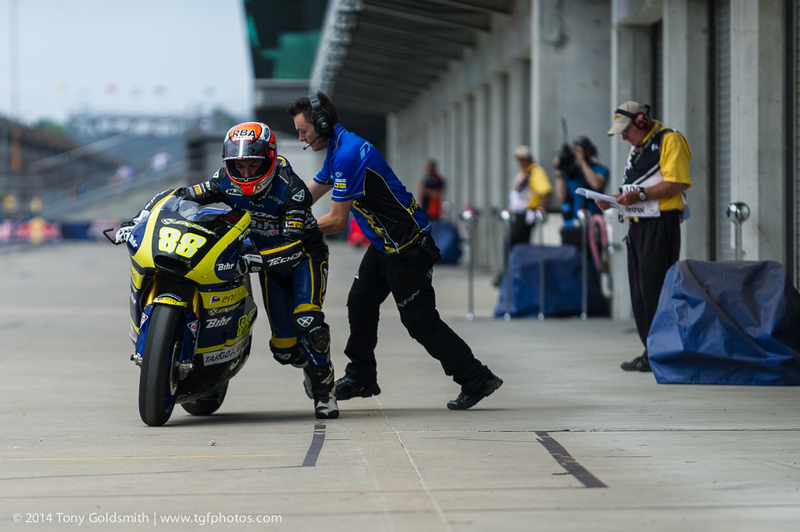 When Edwards finally got to ride the Open class Yamaha, however, he found to his dismay that he could not get on with the Yamaha chassis, and was unable to get the bike to turn. He had pinned his hopes on the arrival of a chassis from FTR, but financial problems for the British chassis manufacturer meant he was left to struggle with the Yamaha frame until Mugello. When a new chassis did arrive, fresh from the drawing board of now ex-FTR designer Mark Taylor, it did not see Edwards drastically improve his pace. What’s Bigger: Indy Motor Speedway or Big 10 Football? 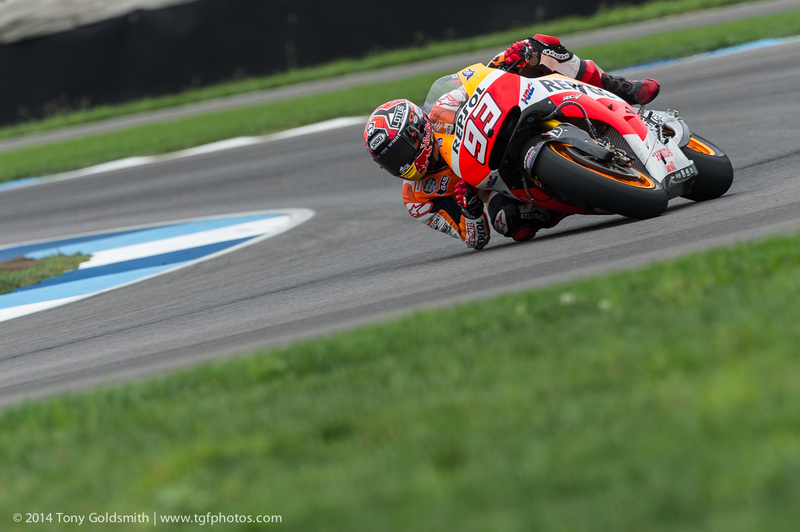 MotoGP’s Red Bull Indianapolis Grand Prix is this weekend, in case you were unaware. As such, Asphalt & Rubber is live from the Indianapolis Motor Speedway this week, the racing capital of the world. While the GP riders may not be huge fans of the IMS infield circuit (we’ll see if that opinion changes, now that Indy has repaved and reworked several turns), everyone is in agreement that IMS itself is an impressive facility. A massive racing complex, it is hard to explain how big the Indianapolis Motor Speedway is to someone who hasn’t been here…so we thought we would try a new approach over the next few days. First up, Big 10 football. The Hoosier State is known best perhaps for basketball, as a member of the Big 10 Conference, the University of Indiana et al have some mammoth buildings are their disposal. It’s too easy to realize that Indianapolis Motor Speedway is bigger than say Memorial Stadium, but how many Big 10 football fields do you think can fit in the IMS oval? Make your mind up now…no cheating. There are few motorsports venues more iconic than the Indianapolis Motor Speedway. Of the places I’ve visited, only Monza comes close: you can feel the ghosts of all the men and women who have raced there. With its massive grandstands and historic racing museum, the vast facility is breathtaking. It is a magic place. Sadly, the magic is all around the four-kilometer rectangular oval on which the Indy 500 is held, and not so much around the road course used by MotoGP. The rather tight, artificial infield road circuit feels very much like an afterthought, something retrofitted to allow a greater range of activities at the facility. If the oval layout is spectacular, the road course is positively pedestrian. To the credit of the Speedway, they have done an awful lot to try to improve the track. Last year, there were at least four different types of asphalt around the circuit, and the infield section was considered too tight for overtaking maneuvers. In an effort to solve both those problems at a stroke, Turns 3 and 4, Turn 7 and Turns 15 and 16 have all been modified. The changes are aimed at opening the corners up a little, making them a little faster and more flowing. The change at Turns 3 and 4 should make for more natural corners, and a better transition back onto the outside oval. Turn 7 has been altered to open it up, making a more natural chicane rather than the right-angle corner it was before. Turns 15 and 16 are now a little more flowing, and again have been modified to provide a more natural transition onto the oval. At the same time, the infield has been completely resurfaced, so that it now has just one type of asphalt. What difference will the new track layout make? Wilco Zeelenberg estimated the track as being five or six seconds faster than the old layout. Having a single type of asphalt in the infield should also cut down on the number of crashes round the circuit. More importantly, the changes to these corners should make the track more interesting to ride, and more entertaining to watch. Will the changes make passing easier? It’s hard to say. We’ll find out on Sunday. As expected, Jorge Lorenzo’s announcement for the upcoming seasons was made today at Indianapolis Motor Speedway, ahead of the Indianapolis GP. The agreement sees the two-time MotoGP World Champion remaining with the Movistar Yamaha Factory team for the 2015 and 2016 season. In the past months, the Spaniard had been jockeying back and forth with Yamaha Racing regarding his contract, with Lorenzo said to be keen on only a one-year deal. However with a string of poor results so far this season, Lorenzo is fifth in the Championship, and certainly not in the bargaining position he had hoped for going into the summer break. Thus, the Mallorcan finds himself with a two-year deal. 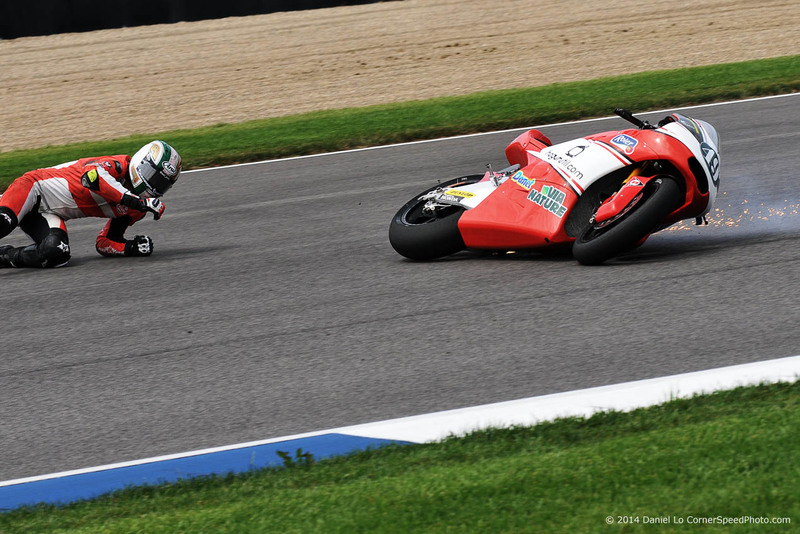 With MotoGP about to get back on track after the short summer break, bike fans will start to gather at Indianapolis. Although the action revolves around the three Grand Prix classes on track at the Indianapolis Motor Speedway, there is plenty more to be doing in and around the track and downtown Indianapolis. The highlights on Friday are the Riders for Health auction, where memorabilia and work by some of the top MotoGP photographers go on sale, to support MotoGP’s adopted charity, and the Indy Mile, at the State Fairground. Saturday’s highlights include the Cycle World Q&A session, where you get to put your questions to the US magazine’s staff writers, including motorcycle genius Kevin Cameron, and a farewell Q&A session with Colin Edwards at his final home Grand Prix. The weekend naturally culminates with the Red Bull Indianapolis Grand Prix on Sunday. With the announcement that Cal Crutchlow is to move to the LCR Honda team for 2015, making space for Andrea Iannone to move up to the Factory Ducati team, the beginnings of a MotoGP grid are starting to emerge for 2015. Both Repsol Honda seats are confirmed, as are both Factory Ducati riders and Valentino Rossi at Movistar Yamaha, with Jorge Lorenzo expected to announce a deal with Yamaha very soon. In the satellite teams, only Pol Espargaro is confirmed at Monster Tech 3 Yamaha, as is Crutchlow at CWM-LCR Honda. With those names in place, we can start to draw up a list of who will be where, and who could be where for 2015. We have broken that list into three separate tables, based on the certainty of their deals: riders with confirmed contracts; riders and teams with deals that are expected to be confirmed very soon; and deals which are likely to happen, but are still not certain.